I so enjoy using Lindy's Stamp Gang products. Today we are playing with Moon Shadow Mists from the Green Label Collection. supplies: Lindy Stamp Gang Moon Shadow Mist (Green Label), White Georgia Pacific Cardstock, Sweet Blush Paper Trey Ink Cardstock, IamRoses.com Flowers, My Pink Stamper Stamp, Modern Label Punch: Stampin' Up!, E-Line Prima Bling, White Embossing Powder, Versa Mark Pad, ATG Gun, Heat Gun. I really need to start working on a new batch of cards for my stash. I've been going through them like crazy and can't seem to keep up....I think this weekend I'll have a card making marathon. Between family and work I go through them like crazy. Wow this is a stunning card, love to watch you achieve the different shades and effect with inks etc. Beautiful card! I love the bling and mist. Putting on that bling looked so easy. I haven't used any that went on so easy. I love the card! Really nice. Luv the effect you got with the mist. 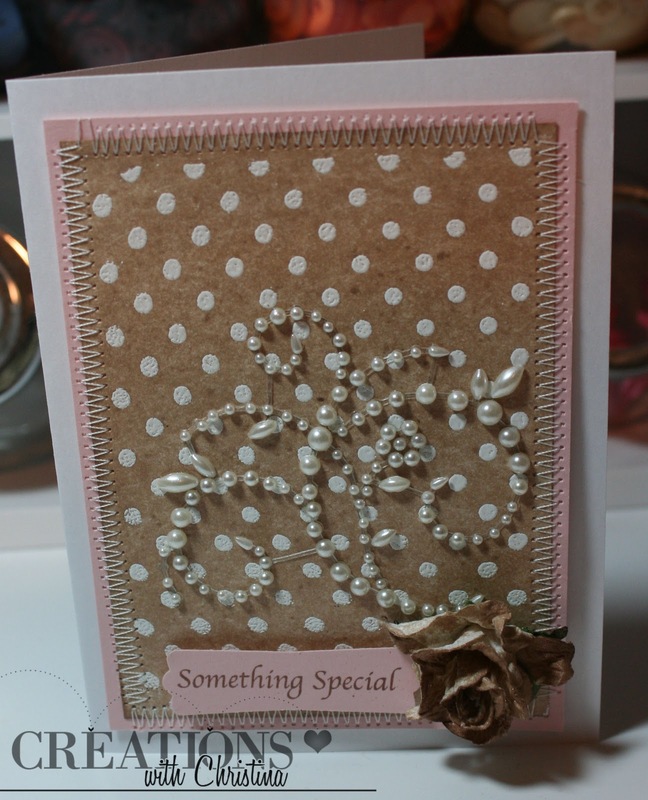 Your satin stitching really turned out nicely and adds to card. Thanks for the video how-to. Gorgeous card! Love the pearls and the stitched edge. Thanks! 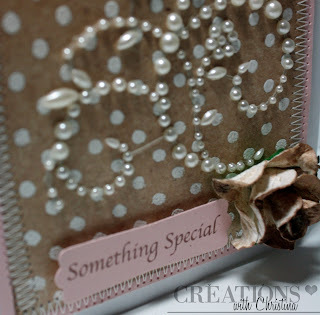 Another beautiful card, I am having alot of trouble finding the prima bling, where do you purchase yours? another question I had was, I have seen alot of the flowers being used from iamroses,how is thier service and how quick is delivery? sorry for bombarding you with all the questions... have a great day. Beautiful card! Love the idea for the emboss resist background! I really like this card. The sentiment is particularly nicely done with your label punch. Thanks for showing us your project. Great card I like the technique of the spray also. Thanks for the thought. Wow !!! Beautiful card Christina. I love the mist. i just bought some Tim Hotlz mist and now that i saw your techniques I can't wait to try it out. Thank for sharing. What a very beautiful card and the designing of the card very well. I love how you decided to go with the softer look for the moon shadow mist. All the sentiments of your card are very beautiful and so amazing for all. Thank you!